Oh how I love this time of year, the door bells start ringing from now until Santa “Claws” comes to town. And today was a spectacular day indeed. A wonderful Blue Tin came to visit us today. 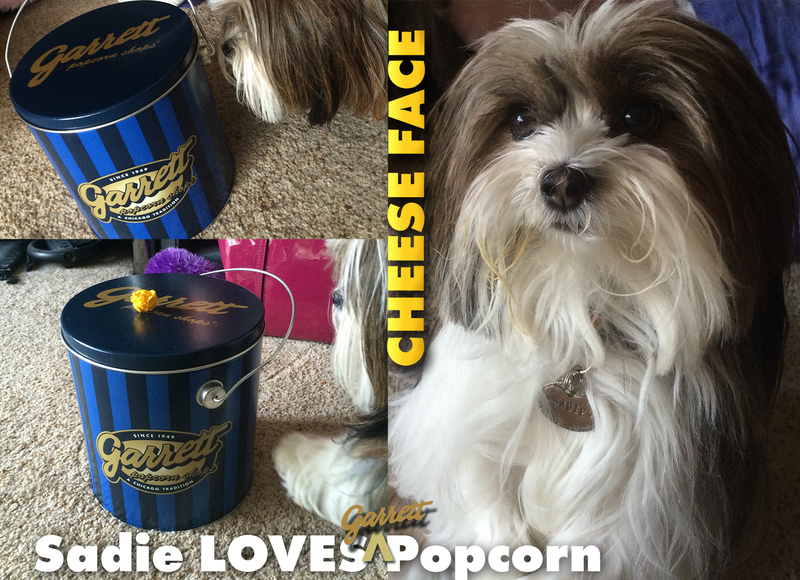 I know the two-leggers have given Garrett’s Popcorn as gifts before but today we got the gift. The gift of POPCORN! Not just any popcorn the cheesiest, fluffiest popcorn I have ever tried. I did not even mind that the two-leggers only let me sample the yellow fluffy pieces while hogging the caramelized ones. They call this popcorn delight the Garrett Mix which combines sweet CaramelCrisp with savory CheeseCorn. Here are some tips for the two-leggers when they wish to feed us four-leggers POPCORN: Popcorn must be a supervised treat and for little munchkins like me it is best to have the two-legger take out any unpopped kernels or hulls, this is perfect because that leaves the fluffy stuff just for us! Also even though I would eat the whole tin myself we four-leggers should only have a few pieces so to watch our daily allowance of starches. Now where did they hide that tin! PUP-corn, I LOVE IT!